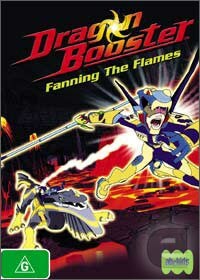 Dragon Booster Fanning the Flames is the latest DVD in the extremely popular children's series that features four action-packed episodes. Once again the nefarious anti-hero Paynn, plots to use the Down City crews to retrieve the sacred bone mark of the Furox in order for him to unleash the Dragon. Unfortunately for mankind, our heroes discover this insidious plot a little too late as per usual but fortunately Artha, Beau and his friends are around to set things straight as the mythical hero known as Dragon Booster. With that said, the transformation effects of Artha and friends into Dragon Booster is simple stunning and really ads to the escapism of the title. This DVD is presented in 16:9 aspect ratio with glorious colours and stunning Dolby Digital 2.0 Stereo with an almost cinematic feel to it. Unfortunately as with the previous incarnation, no special features are featured on this collection. Still great fun and recommended to children of all ages.